This recipe is exactly what we are about here at STRONG ROOTS. It is quick, easy to prepare and so delicious. 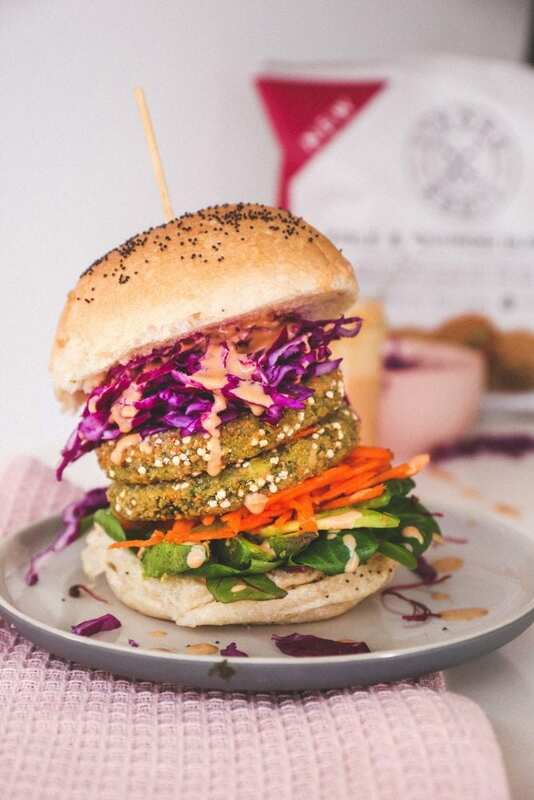 Roz has added grated carrot and a spicy slaw which adds such a great crunch, complimented perfectly with the creaminess of sriracha tahini sauce! Lunch sorted! For more great recipes you can check out Roz’s blog; The Natural Born Feeder! Place the Kale & Quinoa Burgers onto a tray and cook for 15-20 minutes. Dice the cabbage into thin strips, if you have a large grater, use the slice side to do this quickly. In a large bowl, mix the tahini, sriracha, lemon juice, maple syrup, soya, salt, water and vinegar into a smooth texture. Add the diced cabbage, mix well to cover in sauce.